I’ve used the colours Copper Metallic, Basic Black and Pumpkin Pie … the black stars are embossed and is the “A wish for you” star (although the copper powder is not Stampin’ Up!) 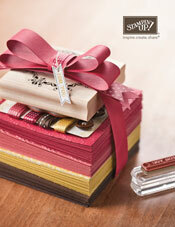 … the ribbon is only retiring product on this card … from Jersey Ribbon Originals (page 147). Check back tomorrow to see my other Godson’s birthday card! !